On Saturday night, inside of the Mandalay Bay in Las Vegas, Nevada, Mike Alvarado produced the biggest victory of his career in winning a unanimous decision over Brandon Rios in another all-action affair. The win serves as a sense of redemption for Alvarado, who was stopped inside of seven rounds by Rios this past October in their first barnburner. During last night’s rematch, Alvarado decided to box more while picking the right moment to land meaningful shots in a vintage performance. 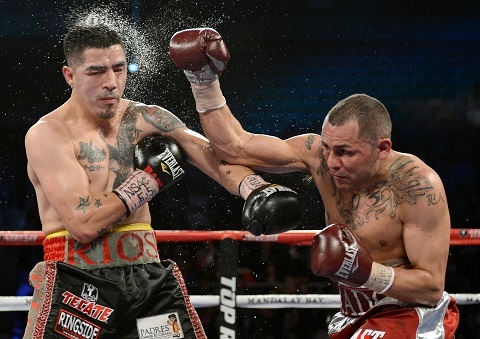 This weekend’s rematch between Brandon Rios and Mike Alvarado is simply the kind of fight that doesn’t need any further hype or special kind of explanation. Facing off later tonight inside of the Mandalay Bay Events Center in Las Vegas in an HBO-televised attraction, Rios and Alvarado will look to again thrill the masses just as they did this past October. Meeting in the squared circle for the first time inside of the Home Depot Center in Carson, California, Rios and Alvarado hacked away at each other round after round in breathtaking fashion. In the sixth round, Rios appeared to hurt Alvarado for the first time and it was one frame later where he finished him off along the ropes, as referee Pat Russell jumped in to save the Denver, Colorado native from any further punishment. Chris Robinson catches up with outspoken Brandon Rios moments after his weigh in ahead of his rematch with Mike Alvarado. Following the weigh in, Rios could be seen exchanging some heated words and flipping off a member of Alvarado’s camp. The two men continued to go back and forth and had to be separated from one another.